The last 2 weeks on Lake Okeechobee, the fishing has been pretty good. The winds have been primary from the South East. The water temp is in the mid 80’s and the water clarity is good on the North end of the lake, but it is getting a little stain on the west end because of the SE wind. 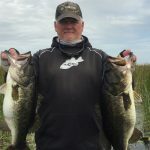 The best baits in the morning in the kissimmee grass are Spinnerbaits, Swim jigs, and Top water. Into the afternoon, I have been flipping kissimmee grass with Pencil Reeds with a Black/Blue jig in 1oz. Here is a picture of me with a couple of fish I caught this week.